AUSTRALIAN live cattle exports are forecast to decline in 2019 to 950,000 head, as a contraction in the northern herd limits the availability of cattle suitable for export. Total cattle exports in 2018 totalled 1,088,870 head, which was up by 26 percent on the 867,056 exported in 2017. Meat & Livestock Australia’s 2019 projections report released today notes that the current wet season, which has had a much later start than previous years, will be pivotal in determining supply trends for the year ahead. 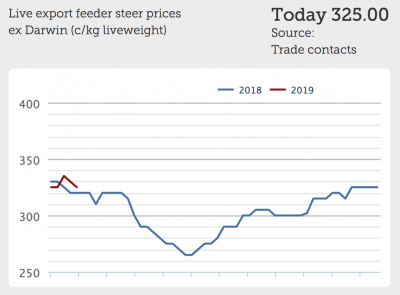 MLA said the high cost of Australian cattle destined for price sensitive markets continues to influence trade conditions, and notes that a further rain-induced lift in the Australian cattle market could apply additional pressure to already expensive export cattle prices. 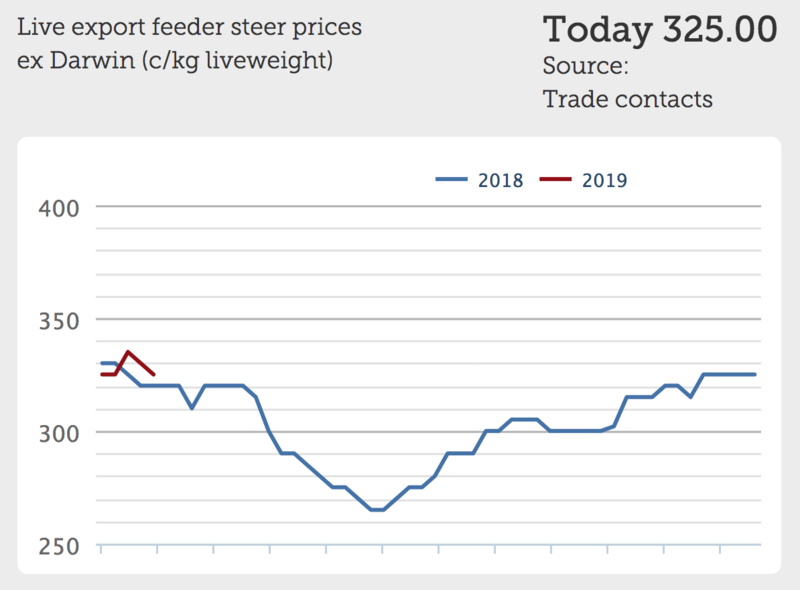 Export feeder steer prices trading out of Darwin have experienced a gradual lift since October due to waning supplies. However, while challenges abound, MLA says the fundamentals for beef consumption growth in the fast growing popularion areas of South-East Asia remain strong. Cattle exports to Indonesia in 2018 totalled 589,000 head, up 15 percent from a year ago. That comprised mainly feeder cattle (538,000 head), with the number of breeders exported well under the target required by the Indonesian government’s 5:1 feeder-breeder policy. Audits of the policy were scheduled to commence in December 2018 but the outcome remains unclear. MLA said the ongoing presence of Indian buffalo meat (IBM) will continue to challenge Australian live cattle in the market, and the Indonesia government last month announced it would continue the import program in 2019, with permits for a further 100,000 tonnes issued to fulfil beef demand during Ramadan and Idul Fitri this year. Following the conclusion of negotiations in August 2018, implementation of the Indonesia-Australia Comprehensive Economic Agreement (IA-CEPA) has been delayed. However, once approved, the agreement should provide further stability for cattle exports to Indonesia. Cattle exports to Vietnam reached just above 202,000 head in 2018, up 22 percent from year-ago levels. 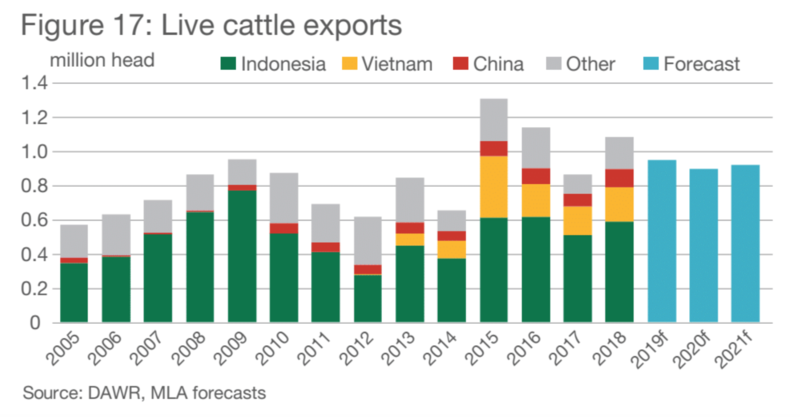 Demand for beef typically increases in the lead up to the Vietnamese New Year festival in February, supporting demand for Australian cattle. However, for the year ahead exports to the market will be strongly tested by the availability and price of Australian cattle. Cattle exports to China increased 44 percent year-on-year to 109,000 head in 2018 – shipments predominantly consisted of breeders but growth was led by a three-fold increase in slaughter cattle (30,000 head). However, slaughter cattle continue to face numerous barriers to entry in China – a value-added tax, a 14-day imposed processing timeframe and regional limitations on sourcing cattle from blue tongue virus zones – and earlier growth in the trade appears to have plateaued. Cattle exports to the Middle East are also faced with an array of challenges. Israel has commenced the process to pass legislation phasing out all livestock imports, while Turkey, balancing domestic policy, has issued a temporary suspension of imported cattle – combined, these markets received close to 80,000 cattle in 2018. Trade to the Middle East will also be tested by the dynamics in the sheep industry, as cattle to the region are shipped in mixed-species loads to reduce costs.